“Recording Jewish Lives,” an anthology just published by the Kaplen JCC on the Palisades, grew out of a memoir-writing class there led from 2006 to 2009 by novelist, playwright, and biographer Susan Dworkin. 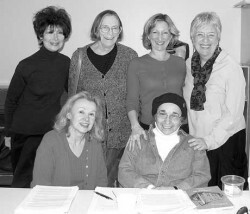 Members of the first “Recording Jewish Lives” class are, back row from left, Dorothy Kershenblatt-Silverstein, Sarah Gottesman Lubin, Rochelle Lazarus, and teacher Susan Dworkin. Agnes Guttmann Dauerman, left, and Harriet Wallenstein are in the front row. Not pictured are Carol Carmel and Irene Ross, who joined the class in its second year. She had some suggestions for people who want to write memoirs. For more information about the anthology, e-mail rlazarus@jccotp.org.